Additional freight costs apply for this item for deliveries to NT, TAS and addresses 100km outside a capital city, please contact us for a quote. Will only fit laptop that are up to 13.3 inches, larger laptops need to purchase 2 x Racking System. The Carrier 40 Cart takes device management to the next level a complete system that offers more flexibility than any other Cart in its category. Baskets by PC Locs. 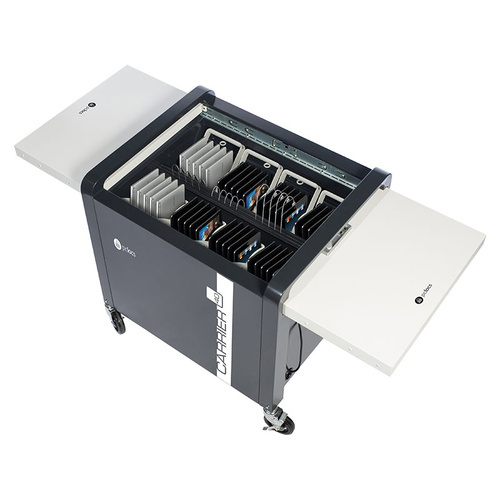 Includes eight 5-slot Carry Baskets giving users the flexibility to deploy Chromebook, Tablet or iPad devices with ease. The new and improved baskets are lighter, easier to grip, and are designed to accommodate almost any device, with or without cases. Safe, efficient and a future proofed power management system for charging 40 devices at once How? ECO Safe Charge can handle the power requirements of almost any device by staging the availability of power to each bank of devices. Improved cable management The Carrier 40 Chromebook Cart features a new centre channel system which holds all the cables in place. It is neater and easy to set up. Large device storage area Chromebook, Tablet and iPad devices can be accessed easier and by more users at once. Are your devices too big for the Baskets? Insert the optional device storage racks into Carts storage area (which replaces the Carry Baskets). The storage racks are designed to accommodate larger devices. New soft closing, sliding hood Secures up to 40 Chromebook, Tablet or iPad devices and the Carry Baskets that they are stored in! Modular and future proofed Option to add syncing functionality to the Carrier 40 Chromebook Cart with PC Locs iQ 16 Sync Charge Boxes. There is no need to go out and by a new Cart. The Carrier 40 Cart has all your needs covered. Highly secure Two-point locking system to keep your valuable devices safe and a heavy duty anchor kit to prevent the Carrier 40 Chromebook Cart from being rolled away. Lock it down! After a day of use, lock the sliding top lids and attach the heavy duty anchor kit for securing the Cart whilst its not in use. Modular syncing (Optional). Think you may need syncing functionality in the future? Dont buy a new Cart Purchase the hand held iQ 16 Sync Charge Box which allows you to carry the unit where syncing is required (sold separately). 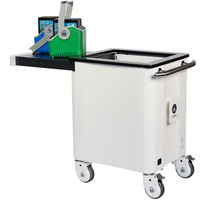 The Carrier 40 Cart by PC Locs Its a truly universal tablet Cart that can store, charge, secure and transport up to 40 Chromebook, Tablet and iPad devices. Chromebook Cart, Tablet Cart, iPad Cart Everything Cart.